Beautifully colored matching Red Creek Jasper elongated drops wrapped in red sheepskin leather and oxidized copper wire for an eye catching autumn colored earring design. Creek jasper is also called by the name, Picasso Jasper, for obvious reasons. Each stone, or in this case set of stones, is like a work of art designed by nature. 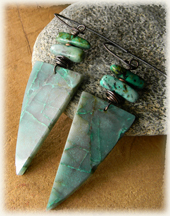 Dramatic natural Chrysocolla stones in matched dagger shapes, with African turquoise and oxidized copper form a bold and primitive earring composition. The stones are cut so that they mirror one another with their soft gray and aqua coloring, and their natural veining patterns. Long triangular dagger shaping of the chrysocolla stones, combines with the center drilled African turquoise to add a tribal feel to the design. 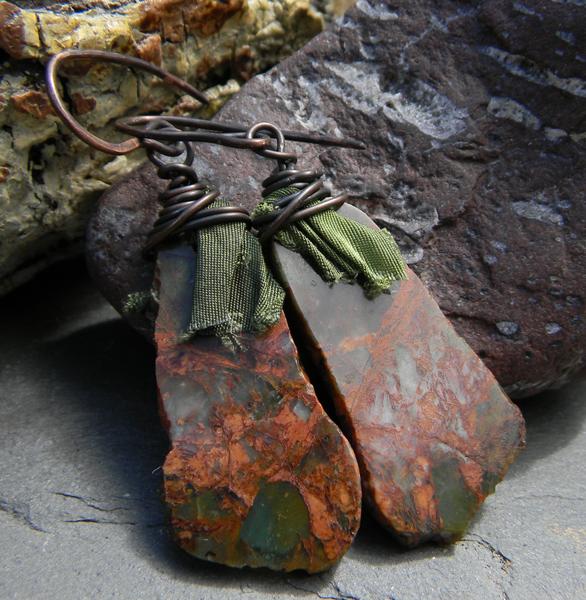 Richly colored African Green Opal natural edge stones, wrapped in recycled sari silk and oxidized copper wire for a rustic autumn earring design. The matched stone earrings and natural edge stone earrings are destined to be very hot this year for holiday shoppers! Each pair of matched stones has its own distinctive markings and colors, taking the term "One of a Kind" to another level.